When you take life to the raw basic essence of survival the priorities of your day change completely from those you experience in the “real” world. Those things you value day to day in a real world are in many ways meaningless. On the trail your day is arranged around, water sources, shelters/campsites, views/points of interest, miles and resupply. With water being one of the major considerations in your planning and rhythm of the day. Reducing your lifestyle to this very basic need for necessary survival means you enter a primeval state, which, in many cases, the western world is missing. At home if you need water it is easy to get a glass from the tap, or the fridge, know that it is safe and plentiful and drink as much as you want. On the trail you have to collect the water as you come to a source. As we started in February the first three months meant a cold water supply and Georgia, North Carolina and Tennessee in particular had amazingly crystal clear, cold, fresh spring mountain water, which tasted like nothing I have had before. But there is an art to water supply which took use a while to get into the swing of and learn the techniques to be effective and efficient at it. Even so, twice we both dehydrated due to miscalculations in water requirements and sources. Although we both recovered it did result in being ill and having to zero (a day where zero miles are hiked) to help recover. Water purification is a personal choice, some never treat (Warren Doyle the 16 plus times thru-hiker, teaches not to treat water except around Pearisburg), some use filters or chemicals or a both. Although I never saw anyone boil their water I am sure there are hikers that did. Also, the methods of carrying and the amount of water is just as much a personal choice. It’s fair to say we tried everything (we would boil untreated water if we was making a hot drink). But eventually we settled on a technique that, prior to the hike, I never imagined I would use. When we started the hike we carried large camelback bladders and a large Katadyne filter. The filter was a hand pump type which was slow to use as the ceramic plate would clog with silt the whole unit would explode and fall apart due to the build up of pressure on a regular basis. Also carrying 2-3 liters of water constantly meant we were hauling extra weight, despite passing water sources on a regular enough basis. Not long after passing into North Carolina we met a South Bound hiker named Prada who amazingly had hike through the severe winter of 2013/2014. He was collecting water from a cascade directly into a bottle which I then saw him add three drops of liquid to from a very small bottle. He stood and watched us as we struggled to pump water from a small pool at the base of the cascade and fill our bladders. He must have wondered what the hell these newbies were thinking. But in a tactful and polite way he explained that he used bleach as his purifier and it kills all virus and bacteria, unlike a filter. To be honest the thought of drinking bleach water was abhorrent. I imagined his insides must have been rotting away from the chemical and wonder the damage he has inflicted on himself. Smiling nicely and thanking him we continued our 20-minute ritual of filling the bladders. As we entered the Smokies we met three experienced former PCT hikers, one being Trip, a Kiwi whom I saw several times in the early stages of the hike. They strolled into a shelter as we were sat around a fire at sunset. Each of the hikers downed the water in their bottles then one of the team grabbed the bottles and headed to the water source. Coming back within a couple minutes I asked how they purified their water; “we don’t”. The philosophy was: “If it’s a spring it doesn’t get purified, if it’s a stream but on higher ground it doesn’t, if it’s a stream in lower ground or near a road it gets treated, rivers and ponds get treated”. Interesting, crazy, but interesting I thought! They went on to explain they only carry 1 liter unless headed into camp for the night without a close supply or a stretch without water. Whenever they came to a source they downed whatever was in their bottle and resupplied. That way they only carried what they needed until the next supply and remained hydrated. This made sense and any opportunity to reduce weight seemed logical and a bonus to my struggling with a huge pack. So I started to follow the 1-liter technique and continued using the system until summiting Katahdin. It was in the Smokies that we were hit by an especially cold spell with snow, and the filter froze. If you are not aware when a filter freezes it becomes useless. The ice expands in the carbon filter and stretches the matrix, which is designed to collect the small particles etc. passing through. As the filter thaws the holes remain expanded and therefore what you are trying to filter out passes easily. We headed into Gatlinburg to resupply and change some gear (my air mattress had burst while hiking through the Smokies in addition to the filter freezing). But this time instead of a filter we went to Aqua Mira liquid drops. These were a huge improvement as they weight almost nothing, you use two chemicals which you mix together, allow it to combine for 5 minutes then add to the water and wait 30 mins and you are good to go. There is no chemical taste and it works well. We did buy those small plastic cases that people put contact eye pieces into, the idea being we could store the chemicals pre-mixed then treat immediately we got to a source instead of water 5 minutes. However we found that upon opening the contact case a visible mist would rise and there was a strong chemical smell so wasn’t too keen on that. As I said I did run out of water twice and to be perfectly honest it was totally my own fault. In one case there was a very unusually hot day and as it was the climb over Dragons Tooth it was a hard days work. I stupidly did not fill my bladder at the river before the climb as I “didn’t fancy river water”! Big mistake and one I learned a valuable lesson from. No matter what, get water whenever you can! Another incident was after leaving McAfees Knob, there is a stretch with no water until after Tinker Cliffs, again I did not resupply at the stream just after the knob as I felt I could make the miles to the next water without issue. I miss calculated that one and ended running out before Tinker. Again a hot day and coming on the back of the dehydration out of Dragon’s Tooth meant I was still recovering. This meant the hike into Daleville was particularly rough and due to the heat and hiking on the ridge-line in the sun and ended up hiking about a mile and then laying in the shade to rest for 20mins. It took all day to do the hike and by the time I got into Daleville I was very ill. I collapsed on the floor of the motel with the aircon on full and naked as I tried to cool off. In the end it resulted in two zeros as I felt so bad. When we got into Daleville we went to the outfitters to get more Aqua Mira, however they had run out but the owner told us to try bleach. Bleach? Are you crazy? However he explained that it’s no different from the treatment of city water you drink all the time. No taste and easier to use than Aqua Mira, there is no pre-mixing, no wait unless the water is from a suspect source (pond, slow river) and even lighter (by now I was headed towards Ultra-lite mentality). 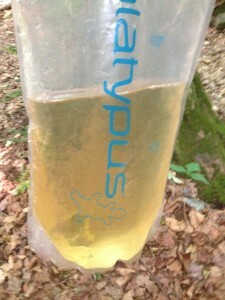 So our water system was a smart bottle for routine drinking, a 1-liter Platypus bladder for stretches without great supplies and I carried a 2-liter Platypus bladder for camp. We would routinely carry 1 liter, down at a water source and resupply adding 3 drops of bleach. It is the technique I still use today although now I tend to carry a smart water bottle plus an empty 2-liter bladder. While water in the lower states is amazing, as I headed into New York, New Jersey and further it became, in some cases, just miserable. We were certainly spoiled early on and the now warm, brown water with mosquito’s lava of the middle states was less than appetizing. Even the addition of bleach did not get rid of the bag of warm piss appearance and you could see the dead insects and bits of “whatever” floating in it. Worse was to come however, Beaver ponds were just unappetizing. I just couldn’t get out of my mind all the Beaver piss in the water……but needs must! My son purchased a sawyer filter to take out the junk and then bleached his water, I just continued with plain bleach. Of all the lessons I learned on the AT, the importance of water is the most significant. Today, as a western society, we take access to water as a right. We turn the tap in our homes, at work or in the local park and expect to get fresh clean drinking water. We can go to a gas station, restaurant and fast-food joint and ask for water for free. But when you are immersed in an environment where you are reliant on nature supplying your water you soon realize its importance and relevance. I am a late starter to long-distance hiking (50 years old) and my first introduction was a 5 1/2 month hike of the AT, with my son! Talk about hitting it hard. Trail folks call me "BigTex" which as I am neither big nor Texan confuses me, but I guess they just smoke too much green stuff. I miss the trail, I miss my trail family and I hope to be a part of your hiking success!